My first dyepot after a long winter hiatus! I was trying for blue, using a good lot of Hydnellum aurantiacum and following directions provided by my mushroom dye mentor, Susan Hopkins. I broke the dried fungus into small pieces, soaked them overnight in plain water, then the next day brought them up to ~170-180 degrees F and held that for an hour. The fibre and silk went into the dyepot the next day, when I added enough ammonia (neither sudsy nor flavoured) to raise the pH to 9. Another hour at the same not-quite-boiling temperature, and I was hoping beyond hope to see the lovely blues that are possible from this toothed fungus. The one thing I didn’t do: I didn’t use distilled water. Our own well water is neutral in almost every way, except that it’s high in calcium. I wonder if that might have made the difference. I won’t say I’m disappointed with this soft sage green, because I’m not, and I have another variety of Hydnellum yet to try—hope springs eternal! I always feel that *any* colour we get from vegetable dyes is a gift, and don’t worry about *which* colour! Your fibre will be beautiful, and you’ll make something wonderful from it. That’s al that’s required. How true . . . thanks! Here in Wisconsin, in areas where we have hard water, we have magnesium as well as calcium in the water. In the northern parts of the state, where the water is soft, it is usually very low pH and often has iron as well. Such an obvious thing, when you think about it! But I never thought about it! Thanks for pointing out the relevance of the water source in the dyer’s results. My next try will be with distilled water – wonder if it will make a difference. The green is gorgeous. Can’t wait to see if the change in water yields the blue you’re looking for. It may just be the fungus itself. I found that H. aurantiacum is produces a less blue and more green dye than other Hydnellum species. Good to know – I ‘ll see what happens with the rest of the Hydnellum I managed to find this season. Just came across a strange fungus growing from the side of a tree stump in my local park. 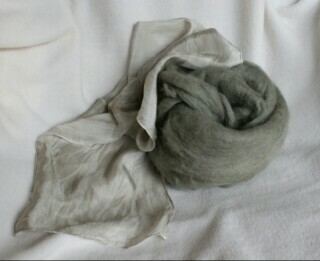 Having just read your blog, i tried making a dye from it (carefully). I know have a pair of Thai pants that have gone a beautiful maroon colour and smell of chocolate!!?? Wow! 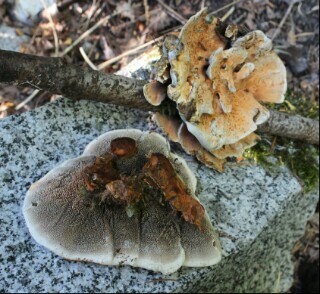 Did you happen to get a picture of the fungus? If not, can you describe it? What colour were the pants before you dyed them? And a mushroom that smells of chocolate! I’m intrigued . . .
Yep, didn’t smell to much of chocolate after a few days in a black tub in the sun though! I have a lot to learn about natural dye process i think. I didn’t cut up or shred the mushroom first which i believe was my first mistake. However where the mushroom was touching the cotton fabric i used it turned purple/maroon colour! My lichen experiment also had good results. I will take pics for you. 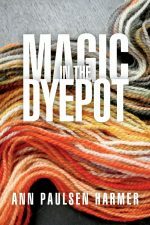 Is there any good books you can recommend on natural dyeing? Yes, I’d love to see your photos! Anything in nature that gives purple is considered special (which is why purple has so often been a “royal” colour). There are any number of good books out there about natural dyeing — The Art and Craft of Natural Dyeing by J N Liles is a standard, and I like Jenny Deane’s Wild Colour for her examples of what you can do with mordants and after baths. I belong to a Natural Dyes forum in Yahoo Groups, and there’s a tremendous amount of knowledge and experience among its members. And if you join, you’ll have access to the archives, where you can find a lot of useful information.